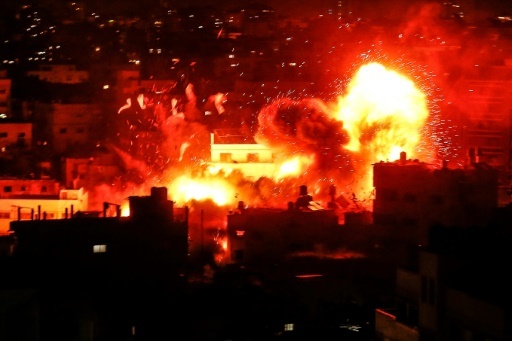 Gaza City (Palestinian Territories) (AFP) – Renewed violence in Gaza threatened to thwart efforts to end months of unrest as Israeli air strikes killed four Palestinians and destroyed a Hamas TV building while a barrage of rocket fire from the enclave left one dead on Tuesday. AFP / Said KHATIB. The outbreak of violence came after months of deadly unrest along the Gaza-Israel border had appeared to be calming. 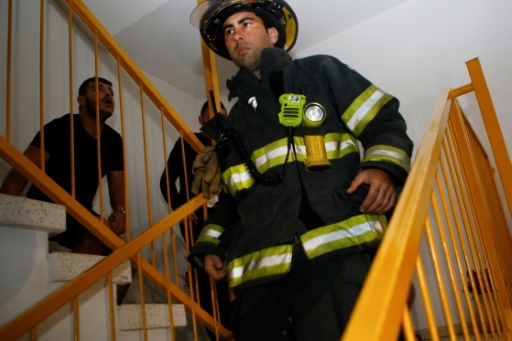 One man was pulled dead from the ruins of a building in southern Israel, emergency services organisation United Hatzalah said, adding that a woman recovered from the same building in the city of Ashkelon was in a critical state. The dead man was identified by police as a Palestinian. A police spokesman said they were looking into the reason for his presence in the Ashkelon building. Medics had earlier reported around 20 Israelis wounded, while Gaza’s health ministry said three Palestinians were killed and nine wounded in the Israeli strikes. Militant group the Popular Front for the Liberation of Palestine said two of those killed were its members and the third was from Islamic Jihad’s armed wing. Another Palestinian civilian wounded in an Israeli attack was pronounced dead Tuesday morning by Gaza’s health ministry. The outbreak of violence came after months of deadly unrest along the Gaza-Israel border had appeared to be calming. AFP / Sophie RAMIS. The Gaza Strip. Before the flare-up, Prime Minister Benjamin Netanyahu had defended his decision to allow Doha to transfer the cash despite criticism from within his own government, saying he wanted to avoid a war if it was not necessary. 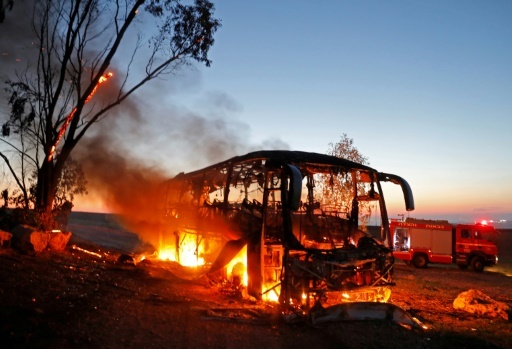 The army said Monday an Israeli bus was hit by an anti-tank missile from the Gaza Strip, causing several injuries. A soldier was severely wounded, it added. AFP / Menahem KAHANA. Hamas vowed revenge after Israeli special forces carried out a raid in southern Gaza on Sunday. The building for Hamas’s Al-Aqsa TV was destroyed in an Israeli strike after a series of warning shots, with the Israeli army saying the station “contributes to Hamas’s military actions”. A former hotel in Gaza City used by Hamas as an internal security office was also hit in an Israeli strike, AFP journalists reported. AFP / GIL COHEN-MAGEN. 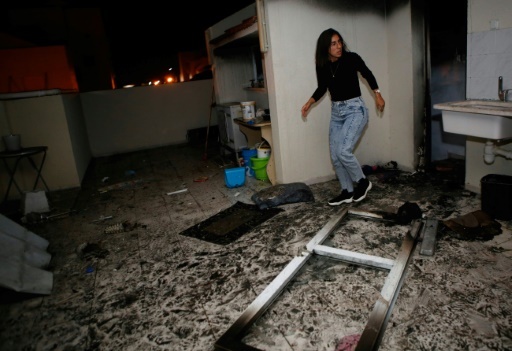 One man was pulled dead from the ruins of a building in southern Israel during the rocket fire from Gaza. 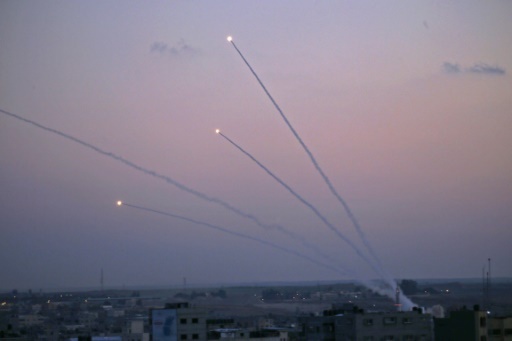 Gaza militants threatened another harsh response after the strike on the TV building and, according to police, more rockets landed in Ashkelon. Hamas said the initial rocket fire was in revenge for the deadly Israeli operation late Sunday in the Gaza Strip. On Sunday, a clash erupted during the covert operation that killed seven Palestinian militants, including a local commander for Hamas’s armed wing, as well as an Israeli army officer. Netanyahu cut short a trip to Paris and rushed home as tensions rose, and on Monday convened a meeting of security chiefs. AFP / Menahem KAHANA. 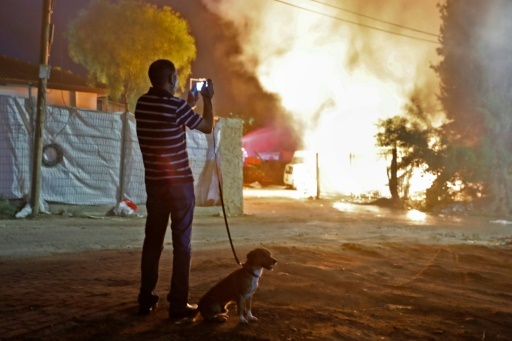 Israel said over 300 rockets were fired from Hamas-run Gaza, and it struck more than 70 militant targets in response. UN Middle East envoy Nickolay Mladenov, who along with Egypt has been seeking a long-term truce between Israel and Hamas, called the escalation “extremely dangerous” and said on Twitter that “restraint must be shown by all”. Israel had stressed its covert operation on Sunday was an intelligence-gathering mission and “not an assassination or abduction”, but Hamas strongly denounced it and vowed revenge. 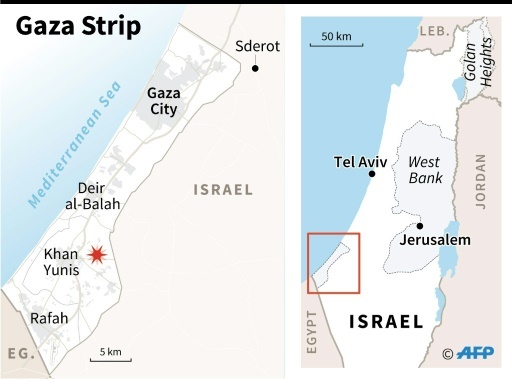 Israel’s military signalled that Sunday’s mission did not go as planned and resulted in the clash, which Palestinian officials said included Israeli air strikes. Hamas’s armed wing, the Ezzedine Al-Qassam Brigades, said the Israeli special forces team had infiltrated near Khan Yunis in the southern Gaza Strip in a civilian car. AFP / GIL COHEN-MAGEN. The UN’s Middle East envoy has said the latest escalation is ‘extremely dangerous’. An exchange of fire followed in which local Al-Qassam commander Nour Baraka was killed along with another militant, it said. The car then attempted to flee and Israeli aircraft provided covering fire. Israel’s military declined to comment on the Al-Qassam account “because of the sensitive nature of the operation”. A funeral was held for the seven Palestinian militants on Monday, attended by thousands, including masked Al-Qassam members carrying rifles, some firing into the air. Violent clashes have accompanied major protests along the Gaza-Israel border that began on March 30. At least 231 Palestinians have since been killed by Israeli fire, the majority shot during protests and clashes, while others died in tank fire or air strikes. Featured Photo: AFP / MAHMUD HAMS. The flare-up came after a deadly Israeli special forces operation in the Gaza Strip on Sunday that led Hamas to vow revenge.